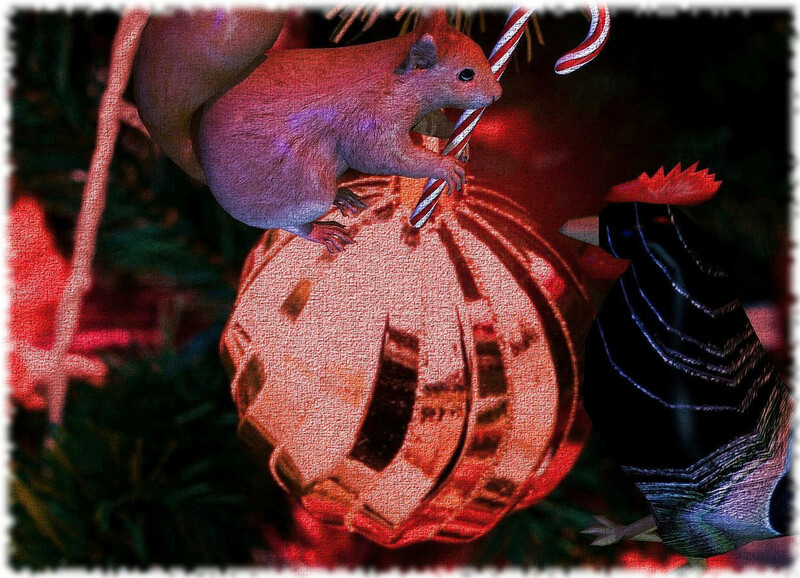 Input text: a Christmas backdrop.a squirrel leans 15 degrees to the front. a candy cane is -.2 feet right of and -.3 feet in front of the squirrel.it leans to the front. a peacock chicken is -2.5 feet above and .1 feet in front of the squirrel. it faces back. the sun's azimuth is 210 degrees. the sun is red.the sun's altitude is 58 degrees.the camera light is dim. a blue light is 1 feet left of the squirrel. a fjord blue light is 2 feet left of the chicken. That is lovely! Merry Christmas to you and to everyone here!